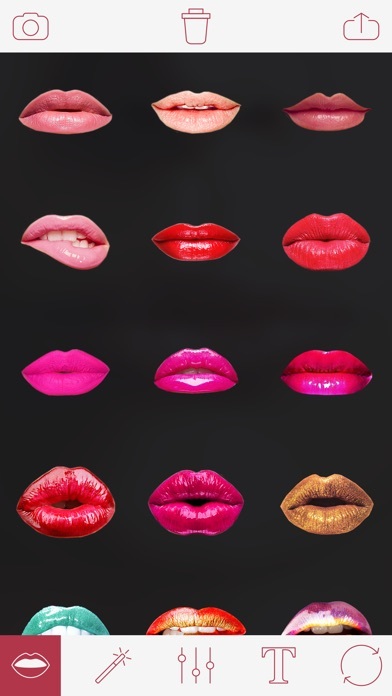 Do you want to have beautiful lips without the intervention of plastic surgeons? Appendix Lips Camera is excellent and professional tool for lip augmentation, breasts, buttocks, nose and reduce the waist. Our photo editor excellent alternative to Photoshop, where you can make yourself skinnier, buff yourself up or enlarge any body parts. Lips Camera Features: - Warp tool (Moves pixels around as you drag the cursor), - Lips Camera has The unique Reconstruct brush (gradually resets the picture to its original state as you brush over it) - Set brush size and hardness - A large number of fantastic Lips photo stickers! - Fast and responsive (real-time) manipulation even on older devices! - Use any picture to warp whether it's from your camera or any photo from your device - Save pictures to your device or SD card - Share your creations online - Lips Camera allows you to open pictures from the gallery app Also you can adjust every photo aspect using Lips Camera tool •Lot of customized magic mirror effects. •Brightness •Contrast •Saturation •Blur •Temperature •Shadows/Highlights •Crop •Focus Make your body perfect with Lips Camera application. This app is junk. I downloaded Pro Lips and it is WAY better. I was hoping this would have pins to point to your exact mouth shape and edit it from there, but this app is solely a camera and a very difficult to use photo manipulator/stretcher. It's not really possible to adjust lip size this way.